It is sometimes essential to synchronize C. elegans to the same larval stage. Our lab simplified and optimized synchronization protocols using standard worm media and culture techniques to ensure that we consistently obtain a sufficient number of worms at the same larval stage for our experiments. To synchronize worm cultures, we utilize unseeded Nematode Growth Media (NGM) plates (solid media with no bacterial food source) on which isolated embryos hatch and arrest at the L1 stage in the absence of food (Johnson et al., 1984; Baugh, 2013). Embryos are isolated using an alkaline hypochlorite solution that dissolves gravid hermaphrodites without damaging their embryos. Significant interest in our approach to this technique was expressed at the 20th International C. elegans Meeting and we are therefore sharing our protocols. Standard NGM is poured into 60 mm Petri plates and dried for 48 hours at room temperature before use (Brenner, 1974; Stiernagle, 2006). The media is not seeded with OP50 E. coli. Gravid hermaphrodites (10 each) from standard, well-fed culture stocks are transferred by picking into 2-50 µl drops of freshly prepared alkaline hypochlorite solution (1 ml bleach, 250 µl of 10M NaOH, and 3.75 ml sterile deionized H2O) on opposite sides of one unseeded 60 mm NGM plate for a total of 20 gravid hermaphrodites (Stiernagle, 2006). The plate is incubated at 20°C for ~20-24 hours for L1 offspring hatching. L1 offspring (see Figure 1 for yield) are transferred to NGM with OP50 for growth to the desired synchronized developmental stage or directly to experimental conditions. Standard NGM with uracil is poured into 100 mm Petri plates and dried for 96 hours at room temperature. The media (8-100 mm plates) is seeded with 500 µl of an overnight broth culture of OP50 E. coli by spreading. The bacterial lawn is grown for 4-6 days at room temperature before transferring 15 gravid hermaphrodites from standard, well-fed culture stocks onto each of the 8-100 mm seeded plates. Worms are cultured at 20°C. The plates are monitored daily until they are barely starved (i.e., there is a large supply of gravid hermaphrodites and minimal OP50 remaining on the plates, which can occur between 3 and 7 days). Worms are sterilely collected with M9 buffer (see Stiernagle, 2006 for recipe) by pipetting 2 ml of M9 buffer onto each plate, tilting the plate, and “washing” the worms from the top to the bottom of the plate with the 2 ml of M9 buffer using a glass Pasteur pipette. This 2 ml of buffer is repeatedly “washed” over the worms to harvest. The worm suspension is collected into a 15 ml conical bottom tube. Approximately 16 ml of worm suspension is collected from all 8 plates, which is divided equally into 2-15 ml conical bottom tubes. The volume is brought to 10 ml with M9 buffer and the worms are pelleted via centrifugation for 1 minute at 1,300 x g. The supernatant is removed and worms are resuspended in 5 ml of freshly prepared alkaline hypochlorite solution (see recipe above). The dissolution of adults and release of embryos are monitored under a stereomicroscope. The suspension is swirled every 1-2 minutes to resuspend and facilitate dissolving of the adults, which takes ~6 minutes. M9 buffer is then added to the alkaline hypochlorite solution to bring the volume to 10 ml. Embryos are pelleted via centrifugation at 1,300 x g for 1 minute. The supernatant is removed and embryos are washed with 10 ml of M9 buffer followed by centrifugation at 1,300 x g for 1 minute. All but ~100 µl of embryo suspension is removed. Approximately 3-4 drops of the embryo suspension is transferred using a glass Pasteur pipette to 3-100 mm unseeded NGM plates each for better distribution and subsequent picking of L1s. The plates are incubated at 20°C for ~20-24 hours for L1 offspring hatching. L1 offspring (see Figure 1 for yield) are transferred to NGM with OP50 for growth to the desired synchronized developmental stage or directly to experimental conditions. We use standard concentrated bleach (8.25% sodium hypochlorite) purchased from a retail store. The alkaline hypochlorite solution is made fresh before use, but the bleach is effective in solution for ~6-8 months if stored in the dark at room temperature. Figure 1: Figure 1. 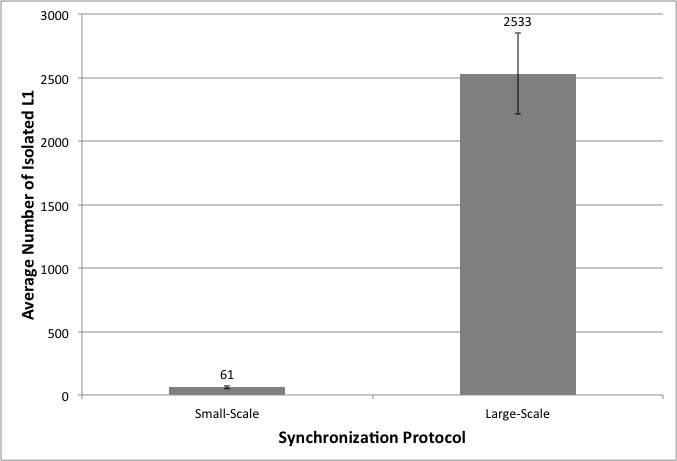 Average number of L1 offspring isolated from the small-scale (n=4) and large-scale (n=3) synchronization protocols. Error bars show standard error of the mean. Baugh LR. (2013). To grow or not to grow: Nutritional control of development during Caenorhabditis elegans L1 arrest. Genetics 194, 539-555. Johnson TE, Mitchell DH, Kline S, Kemal R, Foy J. (1984). Arresting development arrests aging in the nematode Caenorhabditis elegans. Mech. Ageing Dev. 28, 23-40. Stiernagle T. (February 11, 2006). Maintenance of C. elegans. WormBook, ed. The C. elegans Research Community, WormBook, doi/10.1895/wormbook.1.101.1, http://www.wormbook.org. It is well documented that parental experience may profoundly influence subsequent generations. But the mechanisms of such effects have only recently started to be revealed. During the first hours of L1 starvation C. elegans release products of purine metabolism (probably resulting from ATP depletion and/or RNA degradation, Fig. 1). We discovered that the end product of the purine degradation pathway depends on the history of parents of arrested L1 larvae. When comparing exo-metaboloms of arrested L1s (L1 medium) whose parents were grown on bacterial plates vs. liquid bacterial culture we found that progeny of worms grown in liquid produce substantially more allantoin and less uric acid than progeny of worms from plates (Fig. 2). Levels of purine metabolites upstream of uric acid and many other metabolites did not show significant differences (Fig. 2). The small amount of uric acid in eggs could not account for its concentration in L1 medium, suggesting that uric acid is produced by L1 worms and not supplied in the egg. Furthermore, levels of uric acid and upstream purine metabolites were similar in eggs from worms grown on plates and in liquid culture. We conclude that in arrested L1 larvae from plate-grown mothers conversion of uric acid to allantoin is retarded and thus uric acid accumulates, while in L1 worms from liquid culture-grown mothers purine metabolism proceeds to allantoin. Like humans, C. elegans lacks uricase, an enzyme responsible for oxidation of uric acid to allantoin (Ramazzina et al., 2006). Thus one would expect uric acid to be the final product of the purine degradation pathway. The presence of allantoin can be rationalized in two ways. First, uric acid may be oxidized to allantoin by some other enzyme, e.g., a cytochrome P450. In humans, myeloperoxidase has been shown to catalyze this step (Meotti et al., 2011). Second, uric acid is a known antioxidant (Ames et al., 1981), and its oxidation can proceed nonenzymatically, e.g., in the presence of ROS, with allantoin being one of the oxidation products. We profiled mRNA levels in arrested L1 larvae from plate- and liquid culture-grown mothers. We found 145 genes that were different between these two groups by a factor of 3 or more (http://elegans.som.vcu.edu/~alex/purine_metabolism). Half of them were genes encoding proteins with unknown function or homology. sod-3 and sod-5 were overexpressed in L1 progeny from plates compared to liquid culture (3 and 4.1 fold difference). This might indicate that progeny from plates have better ROS protection, while liquid culture progeny are more susceptible to oxidative stress and uric acid acts there as an endogenous antioxidant, resulting in its nonenzymatic oxidation to allantoin. We then compared uric acid and allantoin levels in L1 medium of sod-3(tm760), sod-5(tm1146) and N2 whose parents were grown on plates and found no significant difference. We also measured uric acid and allantoin concentrations in L1 medium (both from plates and liquid culture) in the presence of 200 µM epicatechin, an antioxidant that was shown to reduce oxidative stress in adult C. elegans (González-Manzano et al., 2012). Epicatechin had no effect on uric acid and allantoin levels. Overall, these experiments suggest that different levels of oxidative stress may not explain differences in the uric acid/allantoin ratio. The microarray data showed that the P450 family gene cyp-13A5 is upregulated 5.4 fold in liquid culture progeny, so we hypothesized that cyp-13A5 might catalyze oxidation of uric acid to allantoin. RNAi knockdown of cyp-13A5 in liquid culture-grown mothers did not cause a change in uric acid and allantoin levels in L1 medium of the progeny. In the same conditions unc-22 RNAi caused a partial uncoordinated phenotype, but we did not verify cyp-13A5 knockdown level by qPCR, so this result may not be conclusive. In conclusion, we found that in arrested L1 worms whose parents were grown on plates purine metabolism stops at uric acid, while in arrested L1s whose parents were grown in liquid culture it proceeds one step further and uric acid is converted to allantoin. At present, we do not have a satisfactory explanation for this effect. Finally, we found that there was no significant difference in L1 starvation survival between these two groups of worms. We thank Maciej Kukula for the help with HPLC-MS. Figure 1: Purine metabolism. Modified from Johnson et al. (2009). Figure 2: Ratio of concentrations of various purine metabolites in L1 medium from plate and liquid culture progeny (N2, 25C, 24h after egg prep). Note log2 scale for y-axis. Error bars represent SD of 3 biological replicates. Ames BN, Cathcart R, Schwiers E, Hochstein P. (1981) Uric acid provides an antioxidant defense in humans against oxidant- and radical-caused aging and cancer: a hypothesis. Proc Natl Acad Sci U S A 78, 6858-6862. González-Manzano S, González-Paramás AM, Delgado L, Patianna S, Surco-Laos F, Dueñas M, Santos-Buelga C. (2012) Oxidative status of stressed Caenorhabditis elegans treated with epicatechin. J Agric Food Chem 60, 8911-8916. Johnson RJ, Sautin YY, Oliver WJ, Roncal C, Mu W, Sanchez-Lozada LG, Rodriguez-Iturbe B, Nakagawa T, Benner SA. (2009) Lessons from comparative physiology: could uric acid represent a physiologic alarm signal gone awry in western society? J Comp Physiol B 179, 67–76. Meotti FC, Jameson GNL, Turner R, Harwood DT, Stockwell S, Rees MD, Thomas SR, Kettle AJ. (2011) Urate as a physiological substrate for myeloperoxidase: implications for hyperuricemia and inflammation. J Biol Chem 286, 12901-12911. Ramazzina I, Folli C, Secchi A, Berni1 R, Percudani R. (2006) Completing the uric acid degradation pathway through phylogenetic comparison of whole genomes. Nat Chem Biol 2, 144-148. Survival of L1 arrested larvae in the absence of food is a common experiment in C elegans lifespan studies. A typical protocol involves resuspension of freshly bleached worm eggs in sterile inorganic buffer. Newly hatched worms arrest due to lack of food and their starvation survival in the following days is monitored by taking aliquots and counting live worms. It is tempting to think that such well defined and simple experimental conditions leave little room for variability. In reality, the outcome of this experiment is sensitive to a number of often neglected factors ranging from worm maintenance history dating several generations back to small temperature fluctuations during starvation. Recently, we found additional sources of artifacts in L1 survival assays. When starved L1 larvae are incubated in M9 buffer in plastic tubes (e.g. polypropylene 15-ml tubes), worms tend to adhere to hydrophobic plastic walls, which decreases apparent worm counts in suspension. This effect becomes particularly noticeable at low worm densities (< 3 worms/μl, Fig. 1) We found that precoating tubes with bovine serum albumin (1% aqueous solution for an hour followed by 3 water rinses) renders plastic hydrophilic and greatly reduces the sticking problem. BSA solution and water for rinses should be sterile. When the starvation experiment is performed in glass tubes or vials, worm sticking is not a problem, since clean glass is hydrophilic. The danger in this case comes from the cap, since seemingly inert material lining the cap can significantly affect survival rate if it comes in contact with liquid. We found that L1 worms starved in glass tubes with rubber-lined caps reproducibly survived starvation longer then worms in plastic tubes of the same volume (Fig. 2) or glass tubes with teflon-lined caps (Fig. 3). We detected several compounds in water from tubes with rubber-lined caps and identified one of them as 2-mercaptobenzothiazole (2-MBT), which was present at ca. 0.5 μM. 2-MBT, used as an accelerator in the vulcanization of rubber, is commonly seen in rubber leachates (Reepmeyer and Juhl, 1983). We speculate that longer survival is due to a hormetic effect of one or several chemicals leaching from rubber, which would be toxic at higher concentrations. However, low concentrations of synthetic 2-MBT alone were not sufficient to reproducibly extend L1 starvation survival (at 3 μM and above 2-MBT is toxic to worms). Other components of the rubber leachate may be necessary for the effect. These results demonstrate artifacts that can both decrease and increase apparent survival rates in L1 starvation. Figure 1: BSA coating eliminates worm sticking to plastic. Straight line (blue) indicates 1 to 1 linear relationship between starting density of worm suspension (X-axis) and the number of worms recovered from solution after 1 day of starvation (Y-axis). For uncoated tubes the curve (red) deviates downward indicating that fewer worms were recovered compared to the number that was put in. Note log scale for both axes. Relative worm density of 1 corresponds to 40 worms/μl. Figure 2: Arrested L1 larvae (N2, 25C) survived longer when starved in glass tubes with rubber-lined caps (red) compared to polypropylene plastic tubes (black). Figure 3: Arrested L1 larvae (N2, 25C) survived longer when starved in tubes with rubber-lined caps (red) compared to glass tubes with teflon-lined caps (blue).